I hope you are enjoying the last weeks of winter! I haven’t meant to be out of touch recently. I was not away on some exotic warm-weather holiday. Rather, I have spent the last couple weeks making some improvements here, all with the goal of making Gathering Flavors a more pleasant to visit and recipes easier to use. Recipes are now embedded in each post. This means they are formatted to make them easier to find both in Google searches and within the content area of each post. I reviewed all my recipes for clarity and revised them as needed. Each recipe now includes a “Print” button to make it easier to save the ones you love. The colors on Gathering Flavors are brighter and cleaner to showcase photos and make everything more legible. Photos on the Recipes Page now include links directly to the original recipe. I hope you like the improvement. 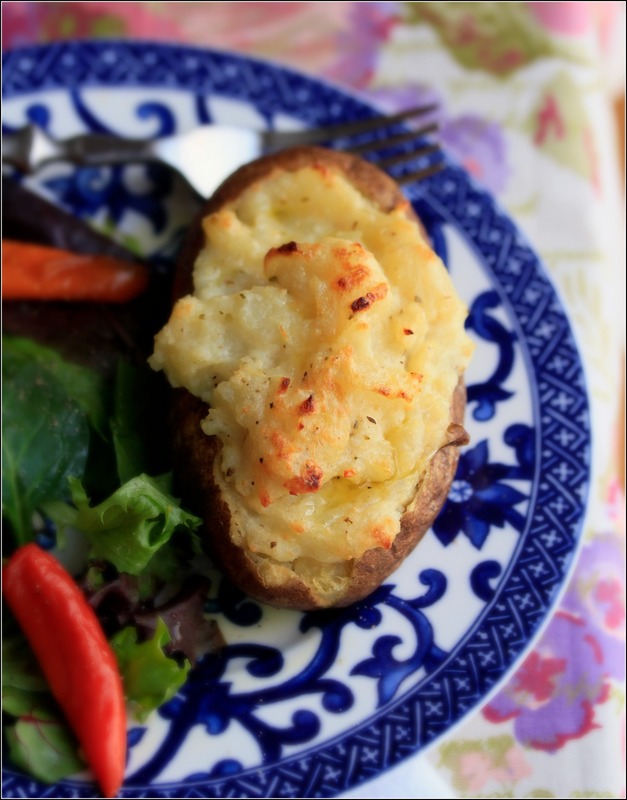 And I hope you like this week’s recipe for Light and Crispy Twice-Baked Potatoes. 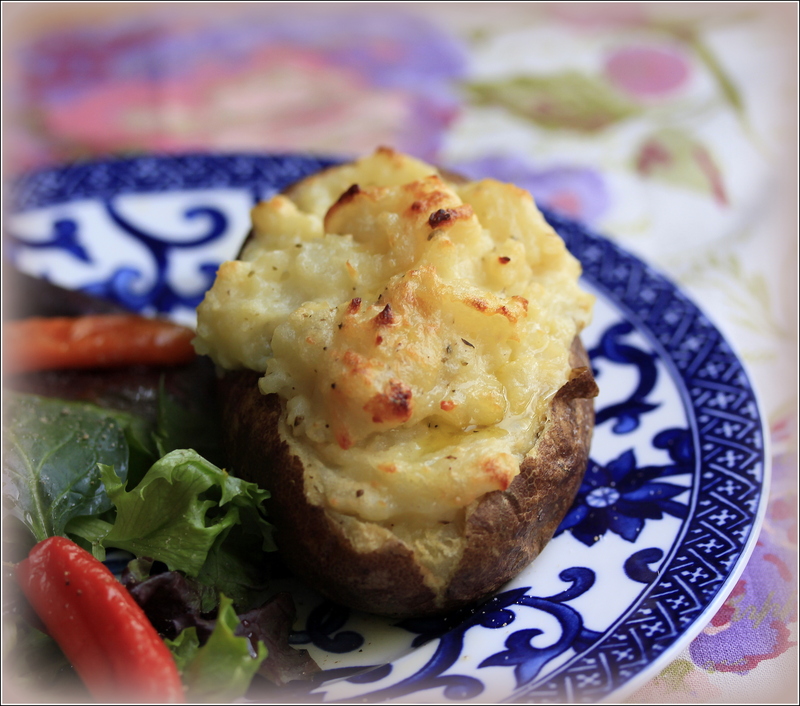 Stuffed potatoes were popular restaurant fare in the ‘80’s and ‘90’s, but they were often rich and heavy. Filled with creamy Greek yogurt and flavored with fresh garlic and herbs, these are much lighter than their predecessors. We ate ours with a light green salad for an immensely satisfying dinner. Remove the potatoes from the oven but leave the oven on. When they are cool enough to handle, cut off the tops of the potatoes. Scoop the pulp into a large bowl, taking care to keep the potato shells in tact. Place the shells back on the parchment lined sheet pan. Add the remaining ¼ cup olive oil, ½ cup grated cheese, yogurt, garlic and oregano to the bowl with the potato pulp. Mash together. Add salt and freshly ground black pepper. Mix in completely. Fill the potato shells with this mixture. Sprinkle with the remaining ¼ cup cheese and place in the oven. Bake until the tops are golden and the potatoes cooked through, about 30 minutes. You can substitute any grated, hard cheese you like. Parmesan and cheddar both work well. 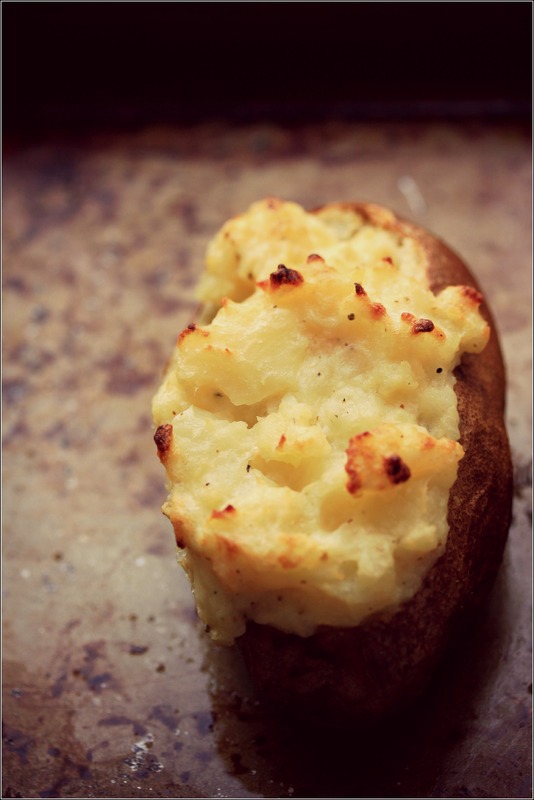 For a heartier dish add ½ cup cooked meat, seafood or eggs to the potato filling. Try using sweet potatoes or yams. Substitute fresh lime juice for the yogurt and add a few freshly snipped herbs instead of the dried oregano. Consider serving the potatoes with a Market Morning Salad, along with Minestrone Soup or Harvest Vegetable Stacks.